Funded through a grant from the National Fish and Wildlife Foundation, the University of Florida is building a network that will respond to situations involving stranded aquatic animals in the nearby coastal areas that include Levy, Dixie and Taylor counties. Animal Rescue Stranding Volunteer Training will be conducted throughout the region (see end of article for next training), to prepare volunteers to safely work with injured marine mammals. 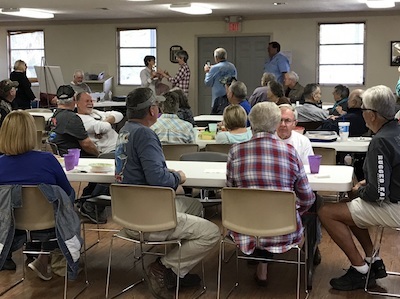 UF also conducts information sessions about the stranding network, such as the program held at the Suwannee Library Technical Center in early May. He added that to do this work, UF also has a stranding agreement with the National Marine Fisheries Service that allows the university’s stranding team to handle and intervene with animals that are in trouble on the coast. Each of the organizations along the coast of Florida all support each other when there are problems such as individual injury and animal recovery, mass strandings and unusual die-offs of the mammal species, Walsh said. He added that the stranding network’s emphasis is to determine why animals come ashore and covers natural disease processes, toxins that may impact animals that are in the environment naturally that affect the animals as well as humans, and disasters such as oil spills. 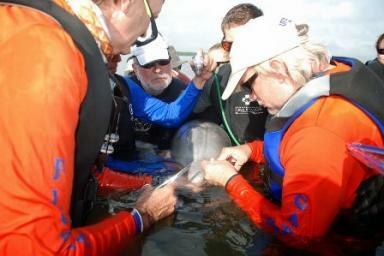 The program will work closely with the Cedar Key Dolphin Project, which has studied dolphin populations in the area, as well as the Fish and Wildlife Conservation Commission, the National Marine Fisheries Service and the UF-IFAS. “It is a response program, but also a research program, and we work like detectives to sort through the issues and find the cause of the problems,” Walsh said. Walsh said the program is now building partnerships with the Fish and Wildlife Service for support space and will have a biologist housed with the Nature Coast Biological Station in Cedar Key and the Lower Suwannee refuge. “All of these groups play a key role in starting a new program to help the marine mammals and ultimately us,” Walsh said. “We have hired a stranding biologist, Mackenzie Russell, who is taking the lead on setting up the relationships with the local people that have the eyes on the water and will be our partners. Walsh added that the current focus is on building a volunteer network and on addressing infrastructure needs. UF Marine Animal Rescue Stranding Volunteer Training will take place, Wednesday, May 17th, 2017 from 3-5pm at the Lower Suwannee National Wildlife Refuge Headquarters (16450 NW 31st Place, Chiefland, FL 32626). RSVPs are required for each person attending the training. Please e-mail Mackenzie Russell at russell.m@ufl.edu to RSVP. Only those over the age of18 are eligible to volunteer at this time. Yes! A new geocache—inside the Suwannee Library Technical Center. For an experienced geocacher it is easy to spot and I was the FTF! In geocaching lingo that means First to Find, and there is often stiff competition among geocachers to be the first one to sign the log in a new cache. So, what is geocaching anyway? The easiest way to describe it is to say it is a GPS guided treasure hunt. Many people remember orienteering; geocaching is a high-tech version of orienteering. A geocache, very basically, is a hidden container with a log and sometimes some small trade items. Caches come in all sizes and shapes, from tiny "nanos" to 5 gallon buckets. They can be found in pretty much any setting you can think of. Some are very easy to find, like the one in Suwannee, while others are placed to be very deliberately "evil!" Geocachers, or those who seek geocaches, also come in all sizes and shapes, as well as all levels of physical ability, and all ages. If you only want to stop next to a guardrail for a quick "Park and Grab," or if you want a long, hard hike, you can find options that are suitable for you. Geocaching has been going on now for 17 years and caches can be found almost everywhere in the world. I have found caches in Cuba, Italy, Mexico, and Peru. The only state where I have yet to find a cache in is Hawaii. Yes, I am planning a trip! To get started you must sign-up on geocaching.com. Once you have an account—free!—you can start looking for nearby caches. Using a hand-held GPS, with the coordinates shown online (provided by the person who placed the cache), you follow them to GZ, ground zero, and start looking. Once you find the cache you must sign a paper log that every cache is required to have, and then, by logging it online on your account at geocaching.com, you will start to build your cache count. I started geocaching in 2004. It has taken me to some wonderful places that I might not otherwise have discovered. Little parks in out of the way places, for example. Through geocaching I realized that I love volcanos! Who knew? Sunset Crater Volcano in Arizona was fascinating. I toured Yellowstone Park by following the caches (in many National Parks the only types of caches available are Earthcaches or Virtual caches; you can learn about these at the website) from one geological feature to the next. I hiked the Rim Trail at the Grand Canyon the same way, following the Virtual caches all the way along. Check it out! My only warning is this: you may become addicted! Editor's Note: Keep watching this blog. 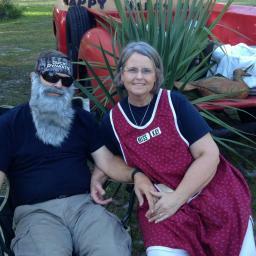 More geocaches may be announced for Suwannee in the near future. 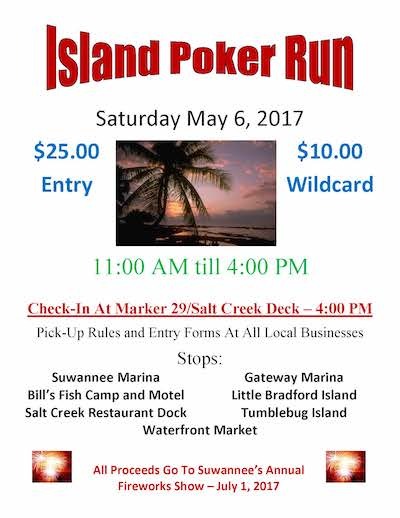 Register at Suwannee Marina, Salt Creek Restaurant, Bill’s Fish Camp, Gateway Marina, Waterfront Market, or Suwannee Community Center. Cost is $25.00 per hand played. You may play one or more hands. You will be given a receipt with the number of hands you are playing written on it. Keep this receipt with you and present it at each stop. You may visit the stops in any order you wish. Visit each of the stops and pick up a card in a sealed envelope for each hand played. You must keep the envelopes sealed. Any envelope unsealed will be disqualified. Return to Salt Creek/Marker 29 Deck no later than 4:00 PM to check in. Anyone arriving after 4:00 PM will be disqualified. You will be given instructions on when to open your envelopes and ‘play’ your hands at this time. Prior to opening the envelopes you will be given an opportunity to purchase a ‘wild card’ for $10.00. DO NOT open your envelopes until instructed to do so. You can have a maximum of eight (8) cards if you purchase a ‘wild card’. You will play your best 5-card poker hand. Wild cards may play as any card. In case of a tie, five (5) cards will be dealt to each player – highest hand wins Cash prizes will be awarded based on the number of entries into the run. Waterfront Market – Located on Canal Street – Visit by canal or land. Tumblebug Island – Located in the East Pass. The boat issuing the cards will be anchored on the East side of the island toward Cedar Key. Little Bradford Island – The Island located in McGriff Channel at the junction with Salt Creek. Go to the Suwannee River, Gulf of Mexico, Salt Creek sign in the McGriff Channel and Little Bradford will be on your right. Gateway Marina – Visit by canal or land. Suwannee Marina – Visit by canal or land. Bill’s Fish Camp and Motel – Visit by canal or land. Salt Creek Restaurant Dock – Your last stop. The floating dock at the back of Salt Creek Restaurant. Tie up and go inside for cool drink and to receive your card. This location may also be visited by land. Remember you must be here no later than 4:00 PM and go to the Tiki Bar Deck! Purchase your wild card while you wait for your fellow players to arrive. The Suwannee River Chamber of Commerce is working diligently to promote the much needed dredging of McGriff Channel. The Chamber is working with government representatives on the local, state, and federal level to push this project. We currently have a lobbyist working on our behalf with all the governmental agencies involved and we are seeing some progress. 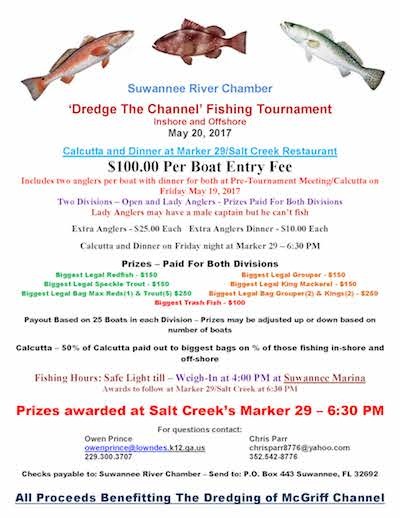 To raise funds for these efforts and to promote public support for the dredging of the channel the Chamber is hosting a fishing tournament on May 20, 2017. There will be a dinner and Calcutta on Friday night with the tournament on Saturday. All proceeds will be used to further the efforts to promote the dredging of the channel. There are two divisions in the tournament. One is the Lady’s Anglers division. 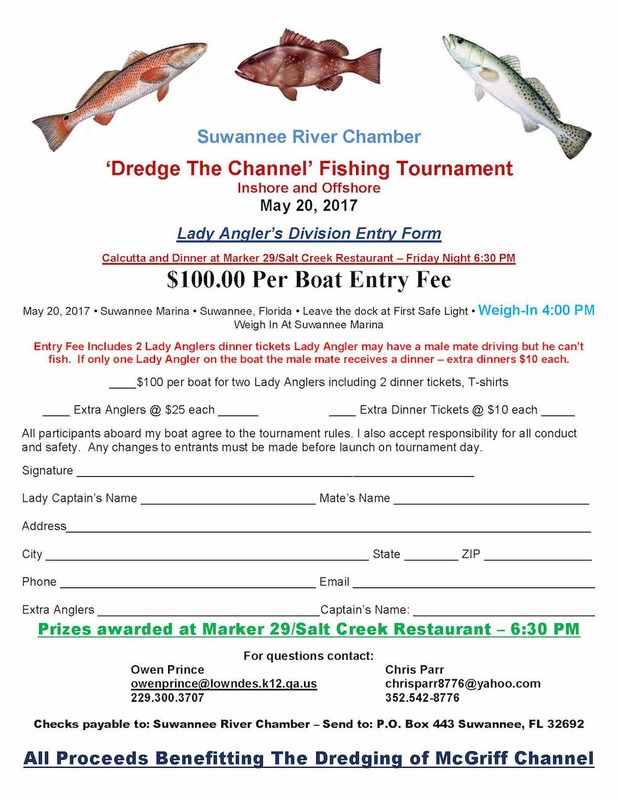 Patterned after the previous two Lady Anglers tournament in Suwannee this division is solely for the ladies. Two or more ladies may fish and they may have a male captain if they wish – as with the previous tournaments he cannot fish. The other division will the Open Division and anyone may fish this division. Ladies may choose to enter either division. Prizes will be the same for both divisions and will be based upon 50 boats. Should we have less than 50 boats the Chamber reserves the right to reduce the amount of the prizes. Prizes for this tournament total $2,400 cash. There will be a Captain’s Dinner and Calcutta on Friday night – May 19 – at Salt Creek’s Marker 29 on the deck. 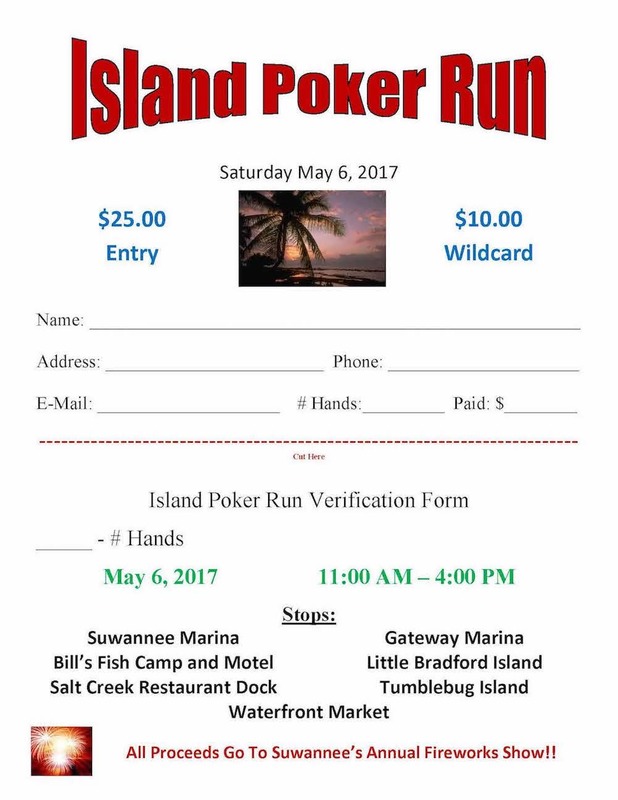 All teams will be auctioned off and 50% of the proceeds will be paid out on Saturday to the highest bidders based on biggest bag limits on the percent of those boats fishing inshore and offshore – in both divisions. All fish weighed in must be legal. All anglers should be aware of size and possession limits. Any legal fish not on the prize list can be weighed as a trash fish. As published in the Dixie County Times on Thursday, March 30, 2017. Last week, residents gathered for a meeting at the Suwannee Community Center in Suwannee with U.S. Fish & Wildlife Ranger, Jason Coates, who is the Engineering Equipment Operator for the Dixie Mainline road. Coates’ message was more of a warning and plea for help in stopping the rampant vandalism or the road may be closed in the future. The Dixie Mainline is what remains of an old logging road that was used in the 1920’s to 1930’s. It became a private hunting access from 1940 – 1998, but was partially acquired and maintained by the Lower Suwannee National Wildlife Refuge (LSNWR) in 1979. In 1998, the road was open to the public and continues to be maintained by the LSNWR. The LSNWR has acquired land from timber companies and private landowners for the past thirty years. Today, they have 53,000 acres and also manage 2,000 acres of land for other owners. The LSNWR property includes property that borders the Suwannee River and 30 miles of Gulf Coast marsh and islands. The refuge opens up areas where citizens can enjoy hiking, biking, hunting, fishing, paddling, photography or just a drive to view the wildlife and landscape. For those who use the Dixie Mainline on a regular basis, it is considered a lifeline between Suwannee and Horseshoe Beach. 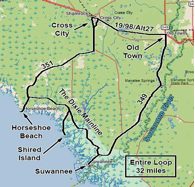 It’s the difference between traveling 57 miles from Suwannee to Horseshoe via CR 349, US 19 and CR 351 to taking the approximate 24-mile trip via the 8.4 miles of the Mainline. Besides normal maintenance on the roads, the US Fish & Wildlife (USFW) rangers perform controlled burns, control invasive plants and bring the forest back to its natural state by planting native trees. Ranger Coates is in charge of not only the 8.4 miles of the Dixie Mainline, but also an additional 185.6 miles of road within the refuge that he maintains. Dixie County has a total of 86 miles of roads, 57 gates and 49 culverts (five on the Mainline) to maintain. Levy County has 108 roads, 57 gates and 65 culverts. All of this takes a great amount of time and money. The USFW allocates $60,000 per year for the upkeep and maintenance of the Dixie Mainline. That pays for equipment, supplies and labor. In addition to the allocation, an average of $25,000 - $35,000 is spent on repairs due to vandalism. Last year the LSNWR paid out $34,360 of taxpayers’ money, just to clean up and repair damages from vandalism and littering! The most recent vandalism event, where a gate that was locked was destroyed and a side-mounted mower was damaged, was the “straw that broke the camel’s back,” bringing Ranger Coates to set up the meeting to make folks aware of the issues that may one day lead to the road’s closure. It is just a matter of time before those in charge of funding are going to get tired of spending unnecessary money for the repair of items that have been vandalized. Litter is another big problem on the Mainline. Last year, volunteers picked up a whopping 160 bags of trash, 4,491 aluminum cans and 12 tires. That was just off the main roadway. During the first three months and three days of 2017, 177 bags of trash have been picked up! Ranger Coates could not have praised the volunteers enough. Their good deeds over the past two years and three months have saved LSNWR money and manpower. Volunteers have donated 2,608 hours of labor at a cost of $31,296. If you would like to join the volunteers, please contact the Refuge office at (352) 493-0238 or you can join the Friends of the Refuge organization, www.friendsofrefuges.org. Safety is the number one priority for the refuge. Safety is why there are signs that are posted before entering the refuge. NO ATV’s, UTV’s or un-tagged or uninsured vehicles are allowed. Yet, drivers of these types of vehicles ignore the signs, travel around the gates or break them. Upon occasion, the road has to be closed for maintenance, flooding, etc. The road is only closed due to safety reasons, yet there are those that ignore the warnings and enter anyway, again, by going around the gate or destroying it. It seems unfair that the bad choices of a few could ruin access to a beautiful piece of Dixie County. That is why Ranger Coates is asking for everyone’s help. Help him keep the road cleaner, safer and open! Let’s all join in policing the road: report anything you may see that is against the rules and the safety of others. Get tag numbers and report those who are littering and vandalizing. Call the local Sheriff’s Office at (352) 498-1231 or Refuge office at (352) 4930238. Together, we can keep the Dixie Mainline open for all to enjoy. The Big Bend Saltwater Paddling Trail and Suwannee River Wilderness Trail converge at Suwannee, making the tiny community an obvious stopping point for paddlers on the two long-distance trails. When they arrive, weary and ready for a shower and a proper meal, local paddling enthusiasts Leroy Harmon and Debbie Meeks mobilize to offer whatever help is needed. Volunteers like Harmon and Meeks are known as Trail Angels. They are usually found in waterfront towns like Suwannee and they go out of their way to assist paddlers. Recently, an unusual paddler, Aaron Carotta, came to town. Liz Sparks, FWC recreation planner and paddling trail advocate alerted the Trail Angel network to be on the watch for Aaron, aka “Adventure Aaron,” and Austin Graham, a cinematographer who joined him for the last leg, after she ran into them at Keaton Beach by chance and learned they were trying to get to the Atlantic coast as fast as possible. "Their detour up the Suwannee was partly my fault,” Meeks says with a laugh. She had given them a Suwannee Wilderness Trail guide and described the wonderful river camps, manatees and springs they would see on the way. She shrugs. "Leroy and I cautioned them that the Suwannee is high right now and we’d never heard of anyone paddling all the way upstream, especially with water running 3-4 mph." Harmon, octogenarian and senior trail angel in Suwannee, as usual went the extra mile or hundred for Aaron and Austin. After they left Suwannee, he drove to meet them along the way for the next three days, buying meals, transporting Austin to Chiefland for an emergency data cable replacement and dispensing local knowledge—just another day in the life of a Trail Angel. Once Aaron surpassed the Guinness record, exhausted from paddling upstream against the Suwannee, he asked to be portaged from just below Branford to the St. Mary’s river. Aaron and Austin reached the Atlantic on Aaron’s 233th expedition day. Read about Aaron's adventure on his Facebook page. Leroy gives Aaron a few tips as he leaves Suwannee. P.S. 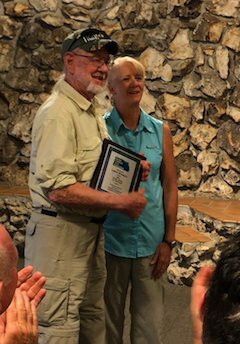 Leroy was named Trail Angel of the Year by the Florida Paddling Trail Association. Jill Lingard presented the award to him on April 22, 2017. In just a couple of hours they collected a truck full. Ann Leverette entered her chili early and came back just in time to win first prize. The Natural Pine Forest trail, near mile eight on the Dixie Mainline, is now easier to hike thanks to Engineering Equipment Operator/Refuge, Jason Coates and several Suwannee residents. This 1.2-mile-long, down-and-back trail has a variety of habitats including a fresh water pond and a marsh view of Shired Island at the end. The trail can be found in the FWS Dixie Mainline Trail Guide ( feature "B" on the map), which is available free at the Suwannee Library. Watch your head on the overgrown trail until the lopper crew comes through. Now it's starting to look like a trail. The finishing crew fine tunes the shape. Left to right, Jane Connors, Kathy, Vonda Bacher, Dusty. The heavy lifters take a break. Pictured are Tom Leverette, David Meeks and Jason Coates. After a productive morning Jason Coates gave everyone a jungle tour back to their cars. 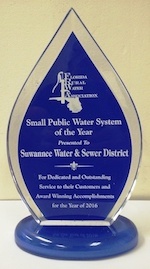 Earlier this year, the Florida Rural Water Association (FRWA) in Tallahassee, Florida chose Suwannee Water & Sewer District as the Small Public Water System of the Year. 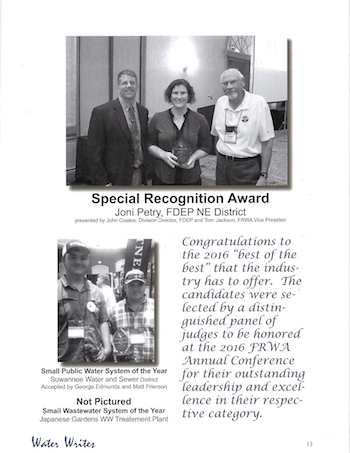 The award was presented to the Suwannee Water & Sewer District at the 2016 FRWA Annual Conference in Daytona Beach on August 8, 2016. The Suwannee Water & Sewer District serves 909 customers in Suwannee. It has a 375,000 GPD Membrane Water Treatment Plant and a 0.250 million gallon a day extended aeration activated sludge domestic wastewater treatment facility with sewage grinder pumps stations located at each house. It is an amazing sight to see the "clouds" of bait fish in the mouths of the creeks and canals around Suwannee. That is what is bringing in the trout! Our guides have been limiting out on trout and Reds every time they go out. Come join the fun. You can use the public ramp on Hwy 349, or use those at Suwannee Marina or Gateway Marina, when you buy your shrimp. Bait is also available at Bill's Fish Camp. Be sure to get a copy of the November “Florida Sportsman” Magazine and read the article on fishing in Suwannee! Ashley Edwards and Jessica Dyals, with help from many in our community, held a Community Trunk or Treat at Glen Dyals park on Saturday, November 29. 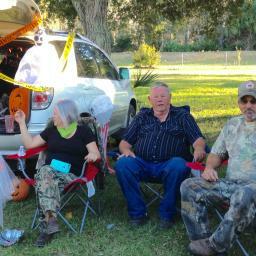 This was a fun and safe way to gather, meet new folks and do our trick or treating. About 15 people set up their “booths” and handed out all kinds of sweet stuff. Some were scary, some kind of “ucky” and some just plain cute. As always, the “train” was there to give the kiddies a ride. 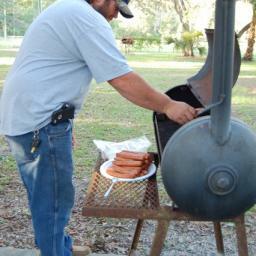 On the supper menu, there were hotdogs, chips and some good sweet tea/drinks. 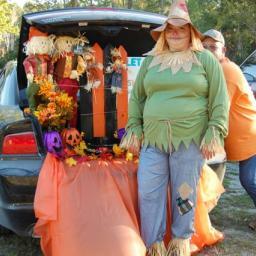 After the trunk or treating was done, there was a costume contest, as well as one for the best decorated trunk. Everyone enjoyed it and I’m sure it will probably happen again next year. 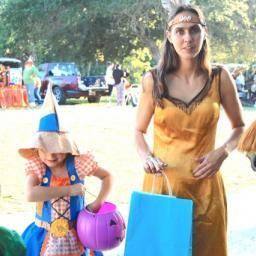 When trick or treating time comes around, consider coming out to join in on the fun. The Suwannee Water & Sewer District will now have their monthly meeting on the third Monday of each month beginning in December 2016 at the Suwannee Community Center. All are welcome to attend. After 21 years, the Chamber's print newsletter, the Suwannee Connection, has finally ceased publication. But don't be sad! The articles residents and visitors have enjoyed for over two decades will continue here in the Suwannee Chamber News blog. In all, 170 editions were printed from January 1995 to March 2016. The Suwannee Connection, created by the first Chamber president, Dan Hayes, was mailed to members and picked up at various locations around the community. In the early days, this included Old Town. 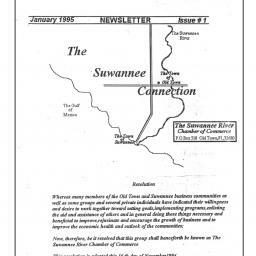 When Dan passed away suddenly in December 1996, the Board voted to continue the Chamber and the newsletter, but to focus both on the community of Suwannee. Over the years, different Chamber members have worn the editor's hat, each lending their distinctive style to the publication. With its stories being all about Suwannee events, history, people and businesses, the Connection became a “newspaper” for our community. Originals of almost every issue of the Suwannee Connection are available for reference at the Suwannee Library Technical Center (adjacent the Fire Dept. building on Hwy 349). Stop by and take a look at our past, as we move into the future. 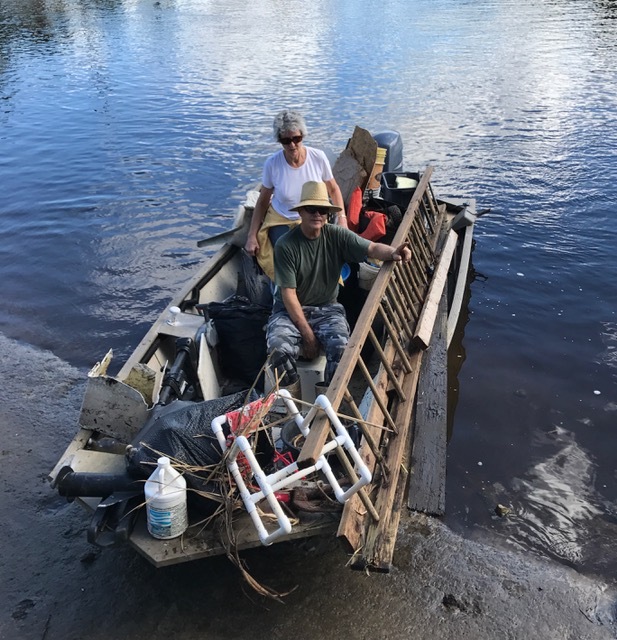 Enjoying perfect cleanup weather on October 20, twenty-three volunteers collected 1,704 lbs of trash from the canals and creeks around the town of Suwannee- four times more than last year! Most of the debris was from Hurricane Hermine. After a chicken & rice lunch served Dixie style out of a well-loved cast iron pot, Daniel Barrand, Refuge Forester, gave an excellent presentation on the history of the Lower Suwannee National Wildlife Refuge that left me feeling proud I helped clean one of the largest pristine coastal wetlands in the country. The new Library/Tech Center building opened for business on Saturday May 7. Local officials and Suwannee residents attended the grand opening. 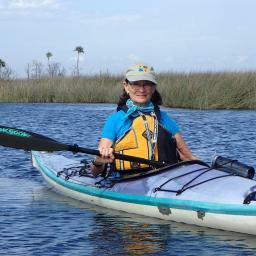 Florida Circumnavigation Saltwater Paddling Trail travelers discover the natural beauty of Suwannee and the hospitality of the resident Trail Angels who meet the weary paddlers and help any way they can. Paddlers cite different reasons for taking the 1,515 mile human-powered salt water challenge. Last year Rich Brand said he intends to write a book about his experience, others paddled to raise awareness for a cause.